Dr. James W Hung, MD is a Doctor primarily located in Danvers, MA. He has 19 years of experience. His specialties include Ophthalmology. He speaks English. Dr. Hung has received 3 awards. The overall average patient rating of Dr. James W Hung is Great. Dr. James W Hung has been rated by 16 patients. From those 16 patients 2 of those left a comment along with their rating. The overall rating for Dr. James W Hung is 3.9 of 5.0 stars. Each time I have visited this office, I have found Dr. Hung both friendly and respectful to me as a patient. He willingly answers questions and intuitively understands how to put one at ease. I would willingly change to another practice if Dr. Hung were to move within close proximity of my home. The staff at this practice are equally professional and thoughtful. We are sorry, it looks like we don't have insurance information. Please call Dr. James W Hung's office for more information. 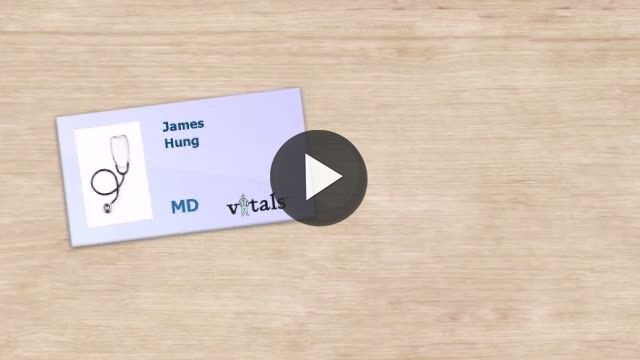 Take a minute to learn about Dr. James W Hung, MD - Ophthalmology in Danvers, MA, in this video. Dr. James W Hung is similar to the following 4 Doctors near Danvers, MA. Dr. James W Hung Is this you? Have you had a recent visit with Dr. James W Hung? Select a star to let us know how it was.